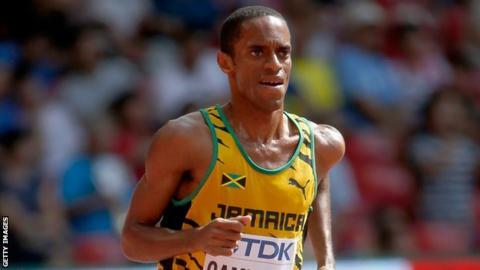 Jamaican runner Kemoy Campbell could be released from hospital within the next week after collapsing during the 3,000m at the Millrose Games in New York. Campbell, 28, was acting as a pace-setter when he collapsed around the 1,000m mark on 9 February. He was in a critical yet stable condition but was taken off sedation last Monday and has been able to communicate and walk in hospital. The Jamaican has since left the intensive care unit. Ray Flynn, the athlete's agent, told BBC Sport on Sunday that Campbell is still awaiting the results of heart scans but is "well on the way to recovery" and there are hopes he could be released from hospital later next week.